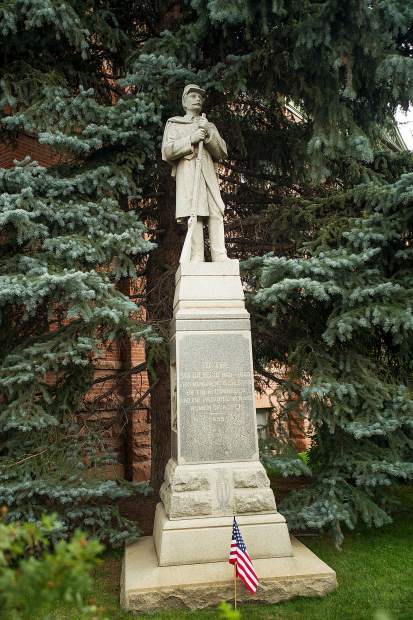 In light of recent violence over Confederate statues, sharp-eyed Aspenites may have noticed the Civil War-era monument located on the southwest lawn of the Pitkin County Courthouse. The granite pedestal and statue of a Civil War soldier has been there for the past 118 years. It was dedicated on Memorial Day 1899 “to the soldiers of 1861-1865,” according to its inscription and a June 1, 1899, article in the Aspen Daily Times. “This monument is erected by their comrades and the patriotic men and women of Aspen,” according to the carving on the pedestal. And while Pitkin County Manager Jon Peacock said Thursday he’s received one email from an area resident asking “us to consider removing it,” a researcher at the Aspen Historical Society said the soldier isn’t meant to represent a member of the Union or the Confederacy. Representatives of the Union side “seem to be more predominant (the Civil War section at the Ute Cemetery consists of soldiers from the Union Army), but there were veterans of the Confederate Army in Aspen, as well,” Cerise said in an email. The Aspen Daily Times article from 1899 quotes Gen. A. Royal, department commander of Colorado and Wyoming of the Grand Army of the Republic, who spoke at the memorial’s dedication the previous day. “Wherever Old Glory waves there is liberty and freedom for the oppressed,” he said, according to the article. “Under the Stars and Stripes there is no place for oppression or imperialism. Later, Royal sounded a further note of unity for those gathered at the courthouse that day. Col. Dan Brown, a member of Royal’s staff, also spoke that day, according to the article. Subsequent Memorial Day newspaper articles struck similar chords of unity over the Civil War and did not mention Union or Confederate soldiers specifically. Many cities throughout the country are taking down or wrestling with removing Confederate statues and monuments. Violent protests took place last weekend in Charlottesville, Virginia, between neo-Nazis and white supremacists and leftist counter-demonstrators over the proposed removal of a statue of Confederate Gen. Robert E. Lee. One woman was killed during the protests. Peacock said Thursday he had not had a chance to research the provenance of the memorial at the courthouse, though he didn’t feel it presented a divisive message.